Soffit is the name given to the board that runs horizontally from the back edge of the bottom of the fascia board to the top of the wall, closing off the roof space at the eaves. Soffit Boards can be plain or vented, and there is also a cost-effective hollow version which has a tongued and grooved effect to mimic timber cladding. Soffit is non load-bearing. PVC Cladding sells FloPlast UPVC Soffit which means that our product is supplied with the quality and product reliability to be expected from an award winning manufacturer. In addition our UPVC Soffit conforms to a number of British Standards and comes complete with industry leading guarantees. The UPVC Soffit Boards stocked by PVC Cladding offer a blemish free, maintenance free solution as they are impermeable to weather and hence will not deteriorate or rot. Roofline ventilation options are numerous with UPVC Soffit Boards ranging from the installation of circular disc soffit vents and soffit vent strips to vented Soffit Boards. As with timber UPVC Soffit Boards can be drilled, screwed, pinned, and cut using suitable tools; however, unlike timber, they do not ignite easily so are more fire retardant. Where Does the Soffit Board Fit? For those that are a little unsure about which sections go where on the eaves construction, the following video gives a brief introduction of the key terms used in the trade. PVC Cladding stock a variety of different styles of UPVC Soffit depending upon the desired finish and application. 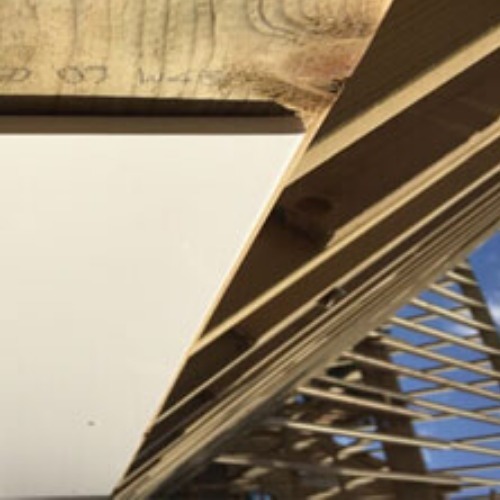 In a refurbishment project involving the replacement of old timber, plywood or masterboard type soffits, our Plain Soffit Boards are the ideal solution. These multi purpose Soffit Boards are 10mm thick and come in a range of widths from 100mm (4") to 404mm (16"). If the board which is being replaced has ventilation strips cut into it then our Vented Soffit Boards would be the ideal solution to ensure ventilation to the roof space. These Vented Soffit Boards are 10mm thick and come in a range of widths from 100mm (4") to 404mm (16"). In the case of a new build project, whether this be a new section of roof or a complete build our range of Vented Soffit will provide the ventilation to the roof space required by Building Regulations, and depending upon how the architect has decided to vent the roof space will often provide the simplest and most easy to install solution. In circumstances where the dimension of the soffit is particularly wide for example in a porch area, or where a "tongue and groove style" effect is desired our range of Hollow Soffit is the ideal solution. As well as producing an attractive "cladding style" effect the Hollow Soffit stocked by PVC Cladding is easy to install as it is light in weight terms. All the styles of UPVC Soffit stocked by PVC Cladding come in 5m lengths as standard. PVC Cladding stock a range of colours of UPVC Soffit Boards in White, Anthracite Grey, Black Ash, Golden Oak and Rosewood. The UPVC Soffit Boards stocked by PVC Cladding carry a product performance and discolouration guarantee of 10 years, and are Class 1 fire rated under BS476. 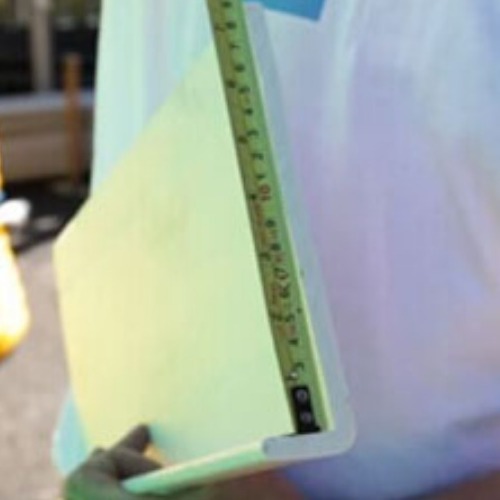 UPVC plain and vented Soffit Boards should be fixed using two 40mm Polytop pins at intervals of no more than 600mm for White Boards and 400mm for Woodgrain Boards. In the case of Hollow Soffit Boards these should be fixed with stainless steel cladding pins which are hidden by the "tongue and groove style" effect. Full installation instructions can be found in our Guides and Tips section.